That’s what September 15th meant for me. We had celebrated earlier so I didn’t remember until I was driving to work. I called him. Told him I loved him. I got grocery store flowers when I got home. Beautifully arranged by the way. What ever did we do without grocery store flowers? Between being a marital therapist and my own experience, I have learned a few things. Since I am on year #24, I’ve divided them into 12’s. Just to be cute. 1. Marriage is not for sissies. It’s hard work. 2. Marriage is not about getting what you want all the time. It’s not a dictatorship. It’s not wanting to win all the time because that would mean the other person would lose all the time. May be OK for you. Not good for the marriage. 3. Marriage is not rocket science. The principles it’s based on are really pretty simple. Kindness. Respect. Loyalty. That kind of thing. 4. Marriage is not unfashionable. It stays vital. Even Brangelina must think so. 5. Marriage is not in and of itself stimulating. Since you are with the same person over a long time, the two of you can get in a rut. You have to keep things fresh. 6. Marriage is not about collecting things. The joys of marriage aren’t tangible. You live them. That’s what makes them so very special. 7. Marriage is not for the impatient. Some of the best stuff takes a while to develop. You have to stick around to find that out. 8. Marriage is not the place for criticism. For abuse. If it is found there, it will ruin any chance of true intimacy or trust and dissolve the hope that once might have existed. 9. Marriage is not a 24-hour repair shop. Your marital partner is not supposed to meet your every need. Some of those needs you may have to take care of yourself. Through your friendships or other activities. 10. Marriage is not self-sustaining. It does not thrive on its own. If all you focus on is the kids, you are making a mistake. 11. Marriage is not boring. Two lives woven together can be quite exciting! There’s just something about watching someone very different from you, living their life in an extremely different way. Up close and personal. You learn from that. 12. Marriage is not without conflict. Knowing how to disagree and work through anger and disappointment is probably the key to lots of stuff going well. Getting to that cooperating, mentioned in #2. 1. Marriage is the potential for an intense, deep and diverse intimacy. Sexual. Emotional. Relational. 2. Marriage is knowing someone has your back. Always. You have theirs. It’s about interdependence. 3. Marriage is realizing that you have been seen in your worst times, and that you are still loved. There’s an overriding sense of gratitude and security. 4. Marriage is sharing old jokes. Or some story that may be told over and over but it still makes you laugh ’til you are left gasping for breath. 5. Marriage is getting teary-eyed together. 6. Marriage is thinking about the other one not being there anymore. And not being able to think about it. 7. 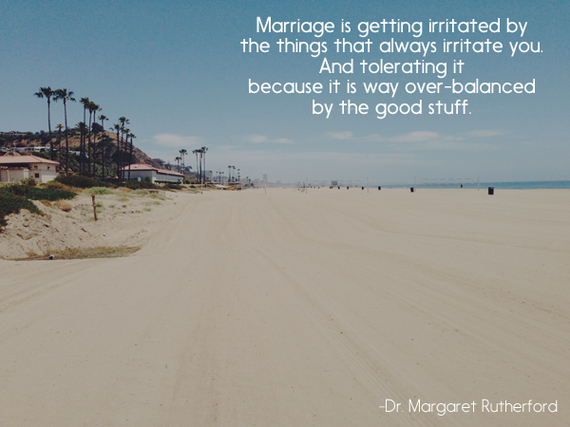 Marriage is getting irritated by the things that always irritate you. Have irritated you for 24 years. Will irritate you for 24 more. And tolerating it because it is way overbalanced by the good stuff. 8. Marriage is not being able to wait to get home to share some little something. 9. Marriage is wishing you were the one having the operation. Or the illness. Not him. 10. Marriage is sometimes fighting. Trying to slowly learn to fight more fairly. To apologize. To listen. To learn. To find resolution. 11. Marriage is about vulnerability. Giving someone the right to hurt or disappoint you. While simultaneously giving that someone the opportunity to bring you tremendous joy and laughter. 12. Marriage is a promise. A vow. To try the hardest you have ever tried in your life. Marriage is a place for the achievement of a personal integrity like no other.